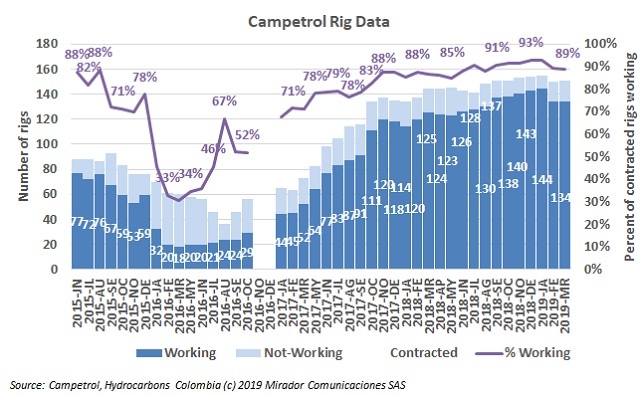 The Colombian Chamber of Goods and Services (Campetrol) reported its drill rig information for March 2019. This metric remained stable compared to the previous month, and the Chamber showed its optimism for a possible increase of this important metric in the coming months. The National Environmental Licensing Agency (ANLA) asked Montajes JM SA to present detailed information about its project in Cundinamarca. Here are the details. The Colombian Chamber of Goods and Services (Campetrol) organized a forum on water protection in Sogamoso (Boyaca). There were local and national authorities, environmentalists, academics and representatives from the oil sector. As we reported recently, what we have been calling the “Commission of Experts” published their final report. It is 173 pages (in Spanish obviously) and not exactly stimulating reading (which shows its scientific ‘cred’). We abridged the two recommendations chapters, 13 and 14, and translated them into English. We hope you find it useful. The Commission of Experts published its final verdict on fracking, and the debate around this topic is starting to finally make sense. Here is why. Bio D, a company that has been working in the production of palm biodiesel for the past 11 years, spoke about its plan to mitigate pollution problems in the country. The National Environmental Licensing Agency (ANLA) met with TPL Colombia LTD to discuss new requirements for the Turpial project, located in the municipalities of Puerto Boyacá (Boyacá) and Puerto Triunfo (Antioquia). The National Environmental Licensing Agency (ANLA) demanded that Tabasco Oil take its water catchment infrastructure out of the Ariporo River. Here are the details. Ecopetrol (NYSE:EC) was able to start clean up activities in Teorama (Norte de Santander), after authorities reported another attack on Coveñas Caño Limon (CCL). The development of these and more stories in our periodic Eco summary. Ecopetrol’s (NYSE:EC) Felipe Bayón said that the firm is working to accelerate the production of cleaner fuels, aimed at improving the air quality in Colombia.